The key to advancing policies is to build diverse political support at grassroots level, leveraging that support against policymakers who put party loyalty before the needs of their constituents. 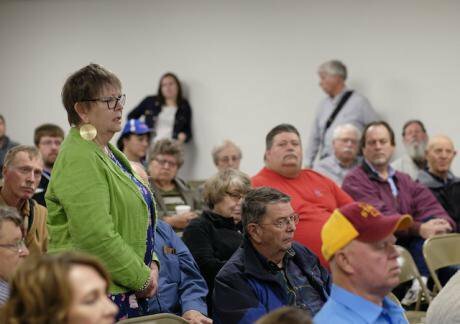 U.S. Sen. Chuck Grassley holds town meeting in Iowa, April 2017. Issues raised by constituents included the affordable health care act, bio diesel fuel credits, immigration, and net neutrality, and members of Congress actually working together to do things for the American people and not just for specific parties or special interests. Jerry Mennenga/Press Association. All rights reserved. On a cold Thursday morning in January, a small group of advocates gathered outside the imposing edifice of the Federal Communications Commission in Washington, DC. They opened the trunk of a red Ford Fusion parked nearby and began unloading more than twenty white banker’s boxes. Within minutes, they had assembled a makeshift cardboard podium. Inside the boxes were more than a million signatures collected in just two weeks from people across the country. Each person had signed on to an online letter demanding the FCC protect net neutrality, the democratic principle that ensures that the internet remains open and free from blocking or throttling of content by the large phone and cable companies that control high-speed internet access. Maintaining an open internet is as fundamental to functioning democracies as protecting free speech rights. After delivering a few speeches standing behind the podium, net neutrality advocates carried the boxes across the building’s threshold and delivered the petitions to the federal agency. This petition delivery at the FCC was just one small moment in years of activism both online and in the streets. Over the past decade, the once obscure issue of net neutrality has grown to draw popular attention from tens of millions of people of every ideological stripe. It’s an explosive issue that at the grassroots level bridges political differences. And while net neutrality protections are currently under threat in Washington – where too many politicians cater to the needs of the cash-rich phone and cable industry lobby – people beyond the reach of the capital’s influence industry remain united. At a very basic level everyone agrees that the companies that provide access to the internet shouldn’t be in the business of controlling the types of information that flows across the network onto the screens of our cellphones, tablets, laptops or home computers. Maintaining an open internet is as fundamental to functioning democracies as protecting free speech rights. Public polling in the United States shows strong support for net neutrality protections from both Democratic and Republican Party voters: a University of Delaware survey found that 85 percent of Republicans and 81 percent of Democrats opposed allowing their internet access provider to prioritize some web content over others. A similar poll from the Internet Freedom Business Alliance found a large majority of self-identified Republicans and conservatives support net neutrality rules, and are willing to stand alongside Democrats in support of an open internet. Net neutrality as an idea is but one part of a larger global movement of people fighting for internet freedom. It is a movement that includes democracy activists in Eastern Europe, Arab Spring protesters in the Middle East and North Africa, and dissident bloggers and “hacktivists” across Asia. In early 2012, more than ten million people of differing political views mobilized online and off to defeat the SOPA/PIPA Web censorship legislation in the United States. In early 2012, more than ten million people of differing political views mobilized online and off to defeat the SOPA/PIPA Web censorship legislation in the United States. Activists on the right and left are using the open internet to fight unchecked spying and surveillance by the NSA and demand online privacy and free speech rights. The internet was designed to be an engine of disintermediation, free speech, and inclusion – a means by which anyone could route around the gatekeepers, build online communities, and share information. It opened the door for new forms of grassroots political organizing and gave smart online activists an impressive means to create diverse coalitions, influence policies and shame bad actors in government. With only a tiny fraction of the financial resources of our opponents, internet freedom advocates struggle every day to preserve this online openness. The very latest threat to net neutrality in the United States comes from the Trump administration, which is determined to unwind the protections won under former President Obama. As politics across the world become even more divisive – as evidenced by recent elections in the United States and Europe – the key to advancing policies is to build diverse political support at the grassroots level, and to leverage that support against policymakers in government who have a tendency to put party loyalty before the needs and demands of their constituents. This is certainly the case with net neutrality in the United States. When we started organizing people around the issue more than ten years ago we focused on building a coalition of strange political bedfellows. While the socially conservative group Christian Coalition opposes almost every position taken by the progressive activists at MoveOn they linked arms in support of the open internet – so much so that they took out a full page ad in the New York Times declaring their shared view. “When it comes to protecting Internet freedom, the Christian Coalition and MoveOn respectfully agree,” the ad read. When we started organizing people around the issue more than ten years ago we focused on building a coalition of strange political bedfellows. The Christian Coalition and MoveOn formed the multifaceted backbone of a net neutrality coalition that included more than a hundred organizations. Librarians joined with gun owners, musicians with gardening clubs, racial justice advocates with video gamers, and libertarians with lefties to demand protections for the open internet. In turn, these groups mobilized their members to act. People picked up their phones and called elected representatives in Congress; they submitted comments into public dockets at the FCC, they organized house parties to talk about the issue and spoke out at local town hall meetings; they wrote songs and created online videos in support of protecting the open internet. More than 20 million people commented as part of the most recent net neutrality proceeding before the FCC, breaking all records for public participation in any matter before the agency. On a few occasions this year, the agency’s online commenting engine crashed unable to manage the flood of comments. The unprecedented growth in grassroots support for net neutrality policies was so rapid and overwhelming that it has caught Washington politicians off guard. Many were left scrambling to alter their positions on the issue – from one of alignment with the powerful phone and cable lobby to positions that favored net neutrality as a concept but differed on the recommended policy solution. After ten years of organizing on the issue, the grassroots managed to shift enough DC policymakers to win landmark net neutrality protections at the FCC. On February 26, 2015, the agency voted to prohibit phone and cable companies from blocking and throttling internet content or giving priority online access to rich companies while relegating the rest of the internet to slow lanes. The election of Donald Trump in 2016 set wheels in motion to take away the online freedoms won by a well organized coalition of internet users. Net neutrality laws put on the books in Brazil, Chile, India and across the European Union face similar threats from powerful business interests. The only way to counter these threats is by creating an international, popular movement for internet freedom.The only way to counter these threats is by creating an international, popular movement for internet freedom. To mobilize this movement, advocates must welcome people of all political persuasions. They must be mobilized through direct outreach at the grassroots, in the personal places where people formulate their opinions beyond the influences of powerful special interests. This robust field strategy must be combined with the expert ability to compel policymakers to side with the public interest. Whether working for internet freedom in the United States or abroad, advocates won’t win the right policies without a symbiosis of fieldwork and policy intelligence. While the fight for net neutrality is far from over, the best long-term strategy for saving the internet will be to reach across ideological differences and build from the bottom up.